Description: Treatment of alkenes with cold, dilute basic KMnO4 leads to 1,2-diols (vicinal diols). Also note that osmium tetroxide (OsO4) does exactly the same reaction. The purpose of the NaOH is to assist in breaking up the intermediate manganate ester that forms after dihydroxylation. If this manganate ester is allowed to sit around, oxidative cleavage of the diol may occur. This is also why the temperature is kept cold. Notes: The reaction works well so long as it is kept cold. If higher temperatures are used, cleavage of the diol to give carbonyl compounds is observed. Note that the reaction does not occur with alkynes. Notes: The boring part goes something like this: water attacks Mn, transfer proton to O, break Mn–O bond, then add second equivalent of water to Mn, transfer proton to O, break Mn–O bond. This gives the free diol. Reference: For those curious about the mechanism I strongly suggest you read this paper: “Permanganate Peroxidation of Cyclohexene: Hydroxide Ion And Salt Effect Studies. Taylor, J. E. ; Green, R. Can. J. Chem. 63, 2777 (1985). Also, apparently under acidic or neutral conditions, more highly oxidized products such as alpha-hydroxy ketones can be formed “without going through the glycols”. See J. Am. Chem. Soc. 1981, 103, 938. Hi James, How would a diene look with this reaction? Would there be 4 alcohol groups? Yes there would – if you added two equivalents of KMnO4. but unless the presence of the two equivalents, the result will sure end up still being just a diol, right? This is very helpful! Thank you. So, when KMnO4 is added to an alkene under high temperatures, then it further oxidizes it correct? I’m getting all confused about the conditions under which KMnO4 reacts. 1. water, neutral gives vicinal ketones. 2. if there’s a base in cold, dilute conditions there’s no reaction. When you throw in the reactions conditions of alkenes too, I cannot keep all this straight in my head if my life depended on it, which indicates to me that I don’t understand the effect of each of the conditions. Is the difference between the last 2 just dependent on the temperature? What is the significance of the base? How do these compare to reaction conditions of an alkene? Etc., etc. Please help me make sense of all this mess!! Thanks! How Would you make diol with an anti addition from an alkene ? Great question. You’d open it up with aqueous acid (H3O+). That protonates the epoxide oxygen, and then water acts as a nucleophile, opening the epoxide. But I can not understand how mangnate ester converts into glycol. Hi, can you please explain the furthur reaction if temperature is given i.e the formation of carbonyl compounds,Mechanism? Oxidative cleavage, similar to the reaction of NaIO4 and Pb(OAc)4. So can i then heat the vicinal diol to form carbonyl compounds? If KMnO4 is present, yes. Sir if multiple double bonds are pesent in an alkene and we use 1 equivalent OsO4 then preferentially diol is formed at which pi bond ?? Plz reply . Generally the more electron rich double bond which generally corresponds to the more substituted double bond. No, generally the more substituted (electron-rich) alkene will react preferentially. Can you explain to me thoroughly about the reaction between cyclohexene and cold acidified kmno4 and cyclohexene with hot acidified kmno4? Does the temp affect the product? I’m having a lot of trouble with organic chem. Yes, the temperature greatly affects the product. At low temperatures you will obtain the 1,2-diol (glycol). At higher temperatures the 1,2-diol will cleave and you will get a reaction product essentially equivalent to ozonolysis. Sir,what will be the effect of cold and dilute KMnO4 on OH group? At low temperatures oxidation will be slower than at room temperature, but it’s difficult to prevent oxidation of OH groups with a strong oxidant like KMnO4. May I ask, does the reaction take place with aldehydes or ketones instead of alkenes? With aldehydes, carboxylic acids will be obtained. I am getring confused in the byproduct of the reaction. What will be the difference in byproducts when cis and trans form of aklene is reacted with alkaline KMnO4? So if I wanted to convert 4-hexen-1-ol to 4-hexanoic acid, would I use potassium permanganate or potassium dichromate and why? I presume you mean hex-4-enoic acid. Avoid KMnO4 because that will react with your alkene. Use dichromate, which should leave the alkene alone. Not this way. Try a process where you form an epoxide first, and then open it with hydroxide ion. Follow the reference at the bottom of the page. What is the difference of using cold dilute neutral KMnO4 with using warm dilute neutral KMnO4 and hot acidic KMnO4 ? Hi, I wanted to ask you, for how long should the reaction be carried over, to prevent the synthesis of a carboxylic acid? Without more information it’s impossible to give a good answer. Dude. Thanks a lot. Amazing website and a real help before my hellish examination. Hey Aditya – glad you found it helpful! What would happen if I used acidified KMnO4 instead of alkaline KMnO4? Cleavage of the manganate ester is harder under acidic conditions and you’d probably end up with oxidative cleavage of the diol. I don’t understand why when adding KMnO4 /NaOH to 1- cyclohexene you just have one product. 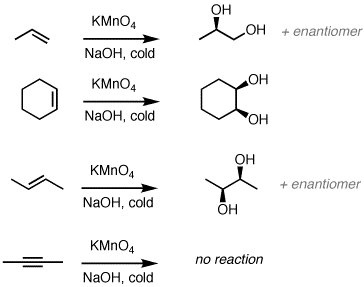 Why doesn’t the enantiomer form in this case and in the others it does? Look at the symmetry. What’s required for a compound to be chiral? so, if cychlorohexene just react with KMnO4 without NaOH, what would happen? Well, you’d do the dihydroxylation and then it would eventually cleave to hexanedial, which would likely oxidize further to adipic acid in the presence of aqueous KMnO4 . If in the reaction equation, all that’s mentioned is ” dilute KMnO⁴, cold ” and no mention of ” NaOH ” whatsoever, are we going to consider the manganate product as the final product? Or is it too unstable to actually be the final product, and hence presence of NaOH is compulsorily required in the reaction? Ask your instructor. Sounds too vague for me. I’d want to have mild base in there. Why process of hydoxylation of alkenes is oxidation and hydration of alkenes is not oxidation? In hydroxylation of alkenes you are breaking C-C and forming C-O . Oxygen is more electronegative than carbon, therefore carbon is increasing its oxidation state. It’s a net oxidation because each carbon is oxidized. With hydration, you’re also breaking C-C but one carbon is forming C-O and the other is forming C-H. One carbon is oxidized and one is reduced, it’s not a net oxidation. Function of NAOH here . And when NAOH/CAO is used in presence of KMNO4 then what will be the result ? To cleave the manganate ester. Once the manganate ester is cleaved there is no chance of oxidative cleavage. I’m wondering why the products of the permanganate oxidation are temperature dependent…By le chateliers, more endothermic reactions should be favored at lower temperatures. But the more exothermic oxidation to form ketones occurs under higher temperatures, while the less exothermic pathway ending in alcohols occurs under lower temperatures? It’s really just a matter of controlling the temperature so that the manganate ester can be hydrolyzed before the oxidative cleavage reaction happens. How does cold KMnO4 behave with double bounds conjugated to a benzene ring, such as seen with styrene? I know that KMnO4 will oxidize styrene to benzoic acid, and until I found this page, was under the impression that it would ALWAYS oxidize to benzoic acid. Does this mean that careful temperature control and monitoring of the reaction form the 1,2-diol as the main product? What affect does the pH of the solution have on the oxidation? Always start with syn addition to form a diol. From there, it could oxidize further.